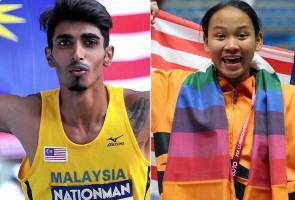 KUALA LUMPUR: National high jump champion Nauraj Singh Randhawa and diving queen Pandelela Rinong Pamg were crowned the Universiti Malaya (UM) Sportsman and Sportswoman of the Year 2016 at UM Sports Awards Night on Wednesday. Nauraj, who made his debut on the stage of the Olympic Games in Rio in 2016 set aside the challenge by national archery athlete Haziq Kamaruddin and national badminton player Iskandar Zulkarnain who were also nominated for the award. While Pandelela who made the country proud by winning the silver medal in the women's 10m platform synchronised with partner, Cheong Jun Hoong, at the Rio Olympics beat discus throw athlete Choo Kang Ni and shuttler Ti Wei Chyi for the title of Sportswoman. Pandelela is currently in action at the FINA Diving World Series Championship in Kazan, Russia. Nauraj and Pandelela each took home a trophy and a cash prize of RM1,000. Meanwhile, the event also saw the Special Badge of University Sports being awarded to seven national Olympians who performed valiantly at the Rio Olympics. They are Pandelela, Wendy Ng Yan Yee, Ahmad Amsyar Azman (diving), Haziq Kamaruddin (archery), Nauraj, Vivian Hoo Kah Mun, Woon Khe Wei (Badminton).